Cross-Site Video Syndication Issues – Can all your channels play in your RSS? If you are a subscriber to Beet TV‘s rss feed, you have probably noticed that they publish video on several platforms. Both Google Video and Youtube channel embeds play within RSS reader windows (I use Google Reader and Bloglines). Back in May, Beet TV indicated they were going to start doing more cross-site video syndication, and today posted a blip TV channel embed. Fine, but the problem is that you cannot play a blip tv file within Beet TV’s current rss feed. Jetset also uses the blip TV player and their segments don’t play within the feed either. It is a little annoying to have to open an entire other window just to watch video from a blog/vlog that posts video on a regular basis. Their sister vlog, Rocketboom, does not use blip tv (that I know of) but share the same problem — you can’t watch their video in the feed. You have to open another window outside of your rss reader. Splashcast plays in RSS feeds, as does dailymotion, Revver, video egg, and brightcove. What’s up with Blip TV? – Can services like Maven Networks, who provide a tool to simultaneously publish on multiple sites, also provide an automatic handy service that notifies you when your video embeds are/aren’t viewable within their rss feed? – What’s the point of subscribing to a video channel’s RSS feed if I can’t watch it within my RSS reader? 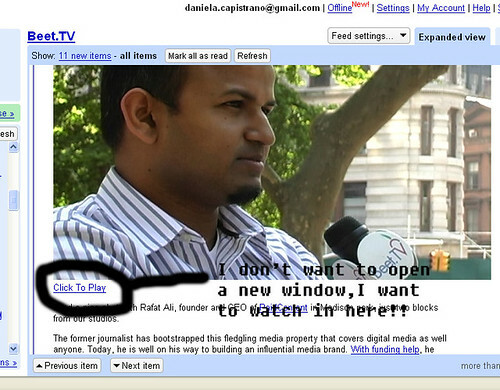 – Is Beet TV’s/Jetset’s problem incorrect markup or is it a problem for Google/Blip TV to solve? PS: Mun2, did you know your videos don’t play in your RSS feed either? Grrr! 🙂 Oh well. I already visit their website every day anyway. But hey – I had to mention it. edit: I understand that the aforementioned feeds (except for Beet TV, who still doesn’t offer a working video podcast feed ugh) are optimized for video podcast subscribers. However, if text consistently accompanies your video it’s silly not to assume that people will also subscribe through their RSS Readers, and will want to be able to view the video while they are reading your text. Within the same window. Gracias.